And here we are, another Dad-Rock Tuesday. 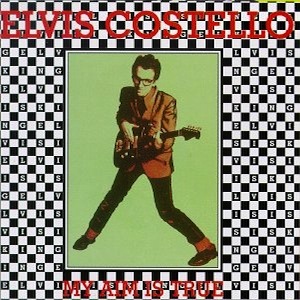 This week, mi padre picked out Elvis Costello’s iconic late 70’s debut, My Aim Is True. Anyway, there’s no doubt that Costello’s voice is the focal point of this record. I’m having trouble describing it, so I’ll just go with “unconventional.” It’s not whiney or obnoxious…I guess it’s just like he’s got a strange, unidentifiable accent of some sort. Regardless, it sounds really cool, and does go well with the basic rock setup that backs him up. As for the actual music and songs that make up this record, My Aim Is True has a bit of everything. I believe that Costello is at his best on some of the faster songs such as Mystery Dance and album-opener Welcome to the Working Week, but there is still something to be said for the slow-tempo track. Alison, probably his best-known song, tells the heartbreaking tale of a guy who is still in love with a woman who has just gotten married. What makes that song is the discrepancy between the lyrics and the sounds being made by the instruments. The music is happy, almost up-beat at times, and is in stark contrast with Costello’s lyrics. Overall, I love this record. Costello paved the way for some of my favorite unconventional voices, and I have to give him props for that. It’s all in the writing to me. Elvis Costello has been one of the best and most prolific songwriters of the past 30 years. One of my very favorites. Check out Imperial Bedroom sometime. In concert he often finishes off with Alison and morph’s into Elvis’ Suspicious Minds. Quite the treat.